The modern plant breeding process is much faster with genetic engineering. The goal to have a more stable plant that is resistant against windstorms and pests leads to a very firm plant structure. To extend the yield of the feed harvest or biogas production, the plant cutting height is reduced year by year. The remaining stubble is shorter and not easy to tumble over. The fight against pests, like the corn moth, also demands a low cutting height. The potential on the tire side is limited by the need to balance flexibility and protection. A good strategy is to bend the stubble before it can penetrate the tire. Structurally, a low tread pattern and a hard, durable tread compound would support this. 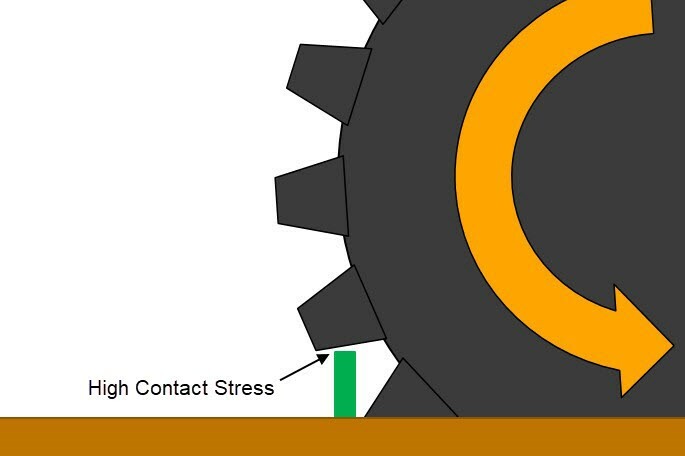 A tire used for loaders in a quarry would be better against stubble; however, it would cause heavy compaction of the soil, lower traction forces and less vehicle mobility due to the high stiffness. As a result, these tires aren’t efficient for agriculture and most of the tires used on the front axle of modern tractors need to have a traction pattern. Here the situation is slightly different. Depending on the size, structure and geometry of the tread pattern, the stubble is clamped and guided to the tire surface. The result is high contact pressure with the possibility of damage. If the tire survives the first 1,000 hits, more will come and cause cavitation at the rubber surface. To minimize the risk, the pattern shape can be optimized. A 45° orientation of the lugs is better than 23°. A flat slope in front of the lug is better than a steep one. In this special case, a soft rubber can help give a larger contact area between tire and stubble to prevent penetration. The Continental Tractor70 and Tractor85 are designed with a flat front slope and a 45° lug orientation to meet these challenges. To avoid penetration of the stubble through the carcass, which can cause air loss, stronger carcass and belt reinforcements can be used. Steel cord is the best material and has been used in forestry tires for over 40 years. However, it can negatively influence agricultural performance with higher stiffness, less efficiency and higher material costs. The Tractor70 and Tractor85 do not have a steel belt. Instead, they are built with N.flex technology, a patent-pending material that has high impact resistance due to the high elongation of nylon. The material also has high robustness, enabling the carcass structure to absorb impact energy without breaking. In addition to tire selection, growers can use a mechanical stubble breaking device which quickly covers the cost of itself. Corn headers with steel sliders and steel rollers in front of tires to bend the stalks are very efficient tools. If a tractor is equipped with a front hydraulic system, the stubble breaking can be managed together with the cultivation in one operational step. Stubble is an ongoing challenge for end users and tire manufacturers. All tire manufacturers deal with it, if they say they are not they are lying, it is just a fact and end users constantly battle it. Stubble has become more of an issue over the past couple of decades for many reasons. Seed populations have increased from an average of 24K per acre to almost 55K. Genetics have also improved to enhance plant health against insects and climate conditions. So now is there not only more of them, they are much more robust- so tires are exposed to twice as many plants that are much more likely to damage a tire. On any given year weather conditions like drought, and freezing play a huge part in the aggravation of stubble damage. Chopping heads have not helped the situation either, as stalks cut 3” to 5” do not allow the tires to push the stalk over to minimize penetration into the tire, essentially creating a field of rebar that the tires have to cross. Tire companies can only do so much with the compound. Everyone says we need to make the compound harder. We work within the “Magic Triangle” when it comes to compounding. The area of the triangle is constant, if the compound is changed to affect a certain physical property, another property of that compound will be affected also. 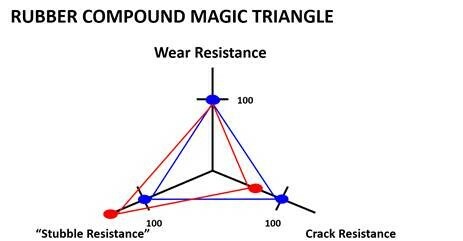 In the example below, when the compound is made “harder” the stubble resistance goes up, but in so doing the compound lost its crack resistance property. The tire may not show signs of stubble but the end user will be just as unhappy when the base of the lugs or sidewalls begin to crack out. It’s a delicate balance. Its not that we aren’t working on it, we are constantly evaluating new compounds to find that balance of stubble resistance and tire longevity and performance. We have also developed special lines of tires specifically designed to fight stubble penetration. Implement tires come to mind that are used on seeding and tillage equipment, these tires are especially susceptible to stubble. We have developed a line that incorporates our stubble resistant tread compound and a construction that uses significantly more actual body plies along with Kevlar Belts. Our Stubble Guard Implement line has proven that stubble penetration can be combated successfully. 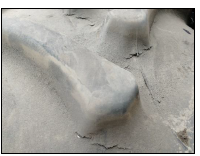 The picture below shows the STANDARD tire (top) found on a piece of seeding or tillage equipment and the STUBBLE GUARD tire (bottom), detailing the difference in construction. The original set of Stubble Guard tires that were placed in 2011 are still running today with no flats after the original set of factory tires had six flats the first season. So what can grower do? I get asked that all the time. First of all, you need to be proactive. If you think about it, front tires on a tractor are replaced 3 or 4 to one with the rears for stubble. One could ask themselves why. The answer is that the front tires are taking the hit and knocking down the stalks ahead of the rears. I always suggest taking a common sense approach, Insanity: Doing the same thing over and over again and expecting different results” – Albert Einstein. Growers spend thousands of dollars replacing tires chewing the ear of their tire salesman off while they are handing him that big check because of the cost, then takes that tractor right back into the same fields not doing anything different “hoping” for different results. That is insanity. My suggestion to all growers that own any brand of tire is to get something in front of the tractor or combine to knock down the stalks ahead of the tires. Just by doing that they would double or triple the life of the tires. I am a huge advocate of mechanical devices that are attached to the equipment like stompers , rollers or any one of a multitude of products that are out there. A minimal investment now will pay dividends for years. Stubble damage is a significant challenge for farm tires. It’s gotten worse over the years as seed companies have bred for standability, which has resulted in stiffer, stronger stalks and stubble that can do significant damage to tread rubber and sidewalls. No tire can eliminate stubble damage, but there are a couple of approaches that can help reduce it. The first step doesn’t come from a tire company at all. Invest in “stalk stompers” or some type of stalk roller, which are bolt-ons that knock over stubble ahead of your combine tires or tractor tires. The cost of a set of those shoes or sleds to mash down residue is less than the cost of replacing a set of premium farm tires, and it’s worth an hour or two of installation time to prevent having to stop to wait on the local service truck to arrive and fix the flat to get you moving again. When it comes to buying tires, spend the extra money to buy tires with stubble-resistant compounds. Yes, there is a difference. When a manufacturer designs a tire, an important part of the equation is balancing the many ingredients in the rubber compound. Over the past decade or so, the industry has fine-tuned the use of natural and synthetic rubber, elastomers, coupling agents and other ingredients to create compound blends that are more puncture resistant than ever before. The chemical composition of the sidewall rubber and tread rubber are different, and both are uniquely blended to ensure both flexibility and durability. It adds some cost, but saves dramatically on repairs and downtime. Look for steel belts. That steel provides puncture resistance and has the added benefit of dissipating heat when you’re running at high speed, extending tire life. Aramid, also called Kevlar, also provides excellent puncture resistance. The last shopping tip is to check with your tire dealer about your tires’ stubble damage warranty. Not all warranties are created equal—not only in terms of how many years they cover or the percentage they pay out based on wear, but also in terms of how quickly and easily the company adjusts a claim. If you’re planting or harvesting, you’ve got other things to do than fight with a tire company. That’s why we developed the ATG Warranty Wizard app and streamlined our warranty program—to get you back out into the field. Once you’ve selected your tires, avoid the old habit of mounting your rear combine tires backwards. People used to do that for a smoother ride, but it accelerates stubble damage. Here’s why: the curved lugs of a combine or tractor tire, oriented correctly, are designed to guide stubble from the centerline of the tire to the outside, minimizing damage. If you turn that lug around, you’re actually capturing stubble from the entire footprint of your tire and channeling it to the center. That will cause a tremendous amount of damage to the lugs, especially at the center, and increase the risk that you’re going to get a puncture. Stubble damage has become an increasing topic of discussion between farmers over the last decade as new varieties and even hybrid crops have come into the farming arena. These new crops are more resistant to diseases, wind damage and other factors that can affect yield. One of the ways in which these crops have noticeably changed is the strength of the stalk and this, combined with changing harvesting techniques, that leave a much shorter stalk in the ground, have contributed to the increase in stubble damage to tires. This seems particularly prevalent with certain varieties of Corn and Soy Bean crops. In the past a longer stalk was easily pushed over by a tire rolling over it, so damage was limited however, today’s shorter and stronger stalks stay upright and can, in some cases, even penetrate the tire causing air loss and costly downtime. 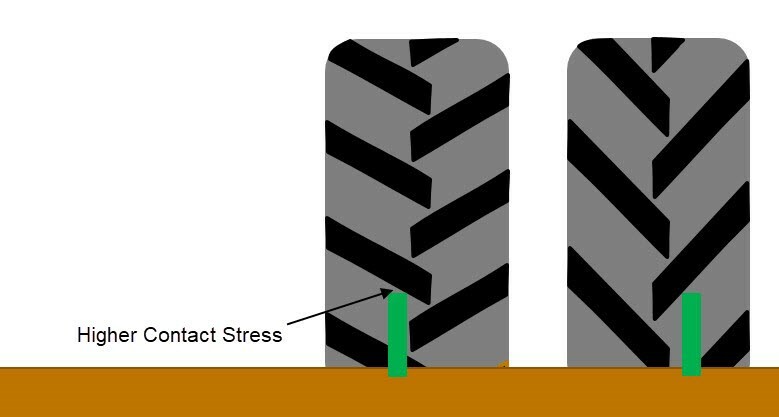 Stubble damage mainly occurs in 2 ways, either cuts and penetrations to the tread or the sidewall or through chipping where repeated contact with the stubble causes small chips of rubber to be dislodged from the tread area, this can eventually lead to exposure of the cords and subsequently the need to replace the tire. So, what steps can be taken to reduce this type of damage? As with all applications, tire selection is very important, this type of damage occurs when tires are run over rows rather than in between rows, selecting a narrow tire that fits between rows can certainly help here. You can regularly see on wider tires which part of the tire was run over the rows as there is damage to only a small portion of the tread, but even this can sometimes be enough to require the tire to be replaced. There is also an opinion that using Radial tires rather than Bias type tires can help as they are more flexible and can envelope obstacles better. Fitting front end attachments known as Stalk or Stubble stompers that push over the stalks before they contact the tire can substantially reduce the problem as these change the angle at which the stalk and tire meet each other and severely limit the chance for a penetration to occur. As a tire manufacturer we constantly evaluate new materials and compounds that can help reduce this type of problem. Our extensive experience in earthmover tires that require rubber compounds that are very resistant to chipping and cutting will help us as we further develop our Agricultural tire range as we can evaluate which of these compounds can be used to enhance the performance of our tires in this area without affecting other important performance parameters. Additionally, we investigate different reinforcement materials to use as breaker belts under the tread to increase protection against penetrations. Finally, discussions with other farmers either through on-line forums or at events and exhibitions to find out what works for particular crop varieties or soil types is also a valuable way of sharing experience and information thereby saving costs and downtime. Over the past two decades, genetically modified crops (corn, soybeans, cotton, sunflowers, etc.) have been developed to produce higher yields and resist insects. While these new advancements can be beneficial, they don’t come without drawbacks. The stalks on these crops tend to be much harder, and if cut short during harvest, can damage tires. They become like pieces of steel sticking up in a field. As rubber tires run over these stalks, they can take chunks out of them. In addition, the stalks can puncture the tires and make them unrepairable and unserviceable. Sidewall punctures can be especially common when using radials and tires wider than the rows (as in no till and limited till). As we all know, the main components of tires are rubber and fabric. Like other types of rubber, tires can only take a limited amount of abuse before failing. As rubber ages, it hardens and makes the tire more resistant to stubble damage. You may be wondering “Why don’t manufacturers make these tires with harder compounds to resist stubble?” In reality, there is a narrow line to walk when compounding rubber for agricultural tires. What works well and improves the tire in one area can cause problems and failures in another. The longevity of the tire and traction must also be taken into consideration. Stubble resistant compounds are used in some agricultural tires; however, they are mostly in implements. Implements have a lighter casing, causing them to be more susceptible to puncturing. BKT Tires manufacturers the AW 711 and the Rib 713 with steel belts and stubble resistant compounding. If possible, farmers should cut stalks a little higher than they would usually. This would allow the tires to push the stalks over instead of running directly over them. There are a number of attachments that can be purchased to fit on combine heads or mount on the front of tractors to do this job. Some examples are the Stalk Crusher (for combines) and Stubble Stomper (for tractors). While these attachments require an initial investment, they will save money in the long run. Stubble damage will always be present (in a larger or smaller scale) and is mostly influenced by way farmers work in the field. Depending on the crop, usually the damage is more cosmetic and doesn’t influence tire performance – wheat stubble damage, for example. On the other hand, corn, soybean or cotton stubble can create significant tire damage. Several points (independent of the crop or soil type and condition) should be considered when choosing wheel-tire size, design or special features. availability and service options at the local tire dealer carries –most brands offer a dealer locator on their webpage as reference. Related to tire design, tire load capacity is mandated by the amount of air each tire can accommodate inside. The more air volume – the higher the load capacity. The second point is choosing tires with the largest balloon ratio possible (the second number – 480/80R50 has an 80% ratio, for example) as the tire balloon will be taller and carry more air. Also, a taller sidewall – specially on tires with flexible sidewalls – allows for a larger sidewall bulge, which increases the footprint and reduces compaction. This larger footprint means the tire is more flexible and can adapt better to the soil or stubble beneath. Another advantage of sidewall bulge on flexible tires is protecting the contact area between the rim and tire bead area, reducing the possibility of stubble entering the area and creating potential air leaks and tire-rim slippage. Always remember to set the correct air pressure for the tire size depending the load it will carry and the speed used to carry that load. First calculate the tractor weight needed (depending the tractor horsepower) and the optimal front-rear weight distribution (adding or removing ballast if needed), then adjust the inflation pressure following the manufacturer recommendation for each tire size. Finally – check the design and quality of the rim. If the rim quality is poor or its damaged, it is possible that the tire will have issues and not be able to perform as it was designed for. Next, let’s focus on the previously planted crops and how they will influence the actions the farmer can take to minimize the stubble damage. We will divide them into small grain and row crops. Small grains – Are planted with small row spacing or without rows so there is no option to use tires that would fit in between rows –some part of the tire will always pass over the stems. The good news is that the stems are thinner, flexible and bend forward when the tire passes on them. Most of the damage is cosmetic and affect tire performance or durability. The alternatives to reduce this damage are choosing a tire offering a larger foot print, using a wider or a larger diameter tire (longer footprint) or a combination of both. Having a larger footprint will reduce the pressure on the stubble and the ground and the effect on the tire. Row crops – These crops are planted at wider row spacing (the most common is 30”), with thicker, harder, and more aggressive stalks. 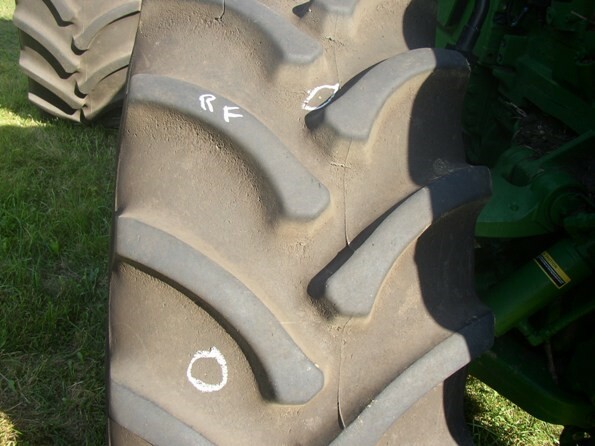 The main recommendations are to work following the rows if possible (so that the lugs are not in contact with the stems), choosing the thinnest tire possible (580 vs 620 or 520 vs 580) to reduce the sidewall damage, and (especially in combines) using stalk stompers attached to the header in front of the tires. There is basically no difference in rubber compound between sizes or models. Each tire has several “compounds types” depending on the function of that specific area of the tire and construction. Tread compound is different as the sidewall compound or the inner-liner compound and each one is developed to supply the best performance. The mix of materials of each of these compounds determines the hardness and flexibility of that area. The lugs compound will be harder and less flexible as compared to the sidewall compound for example. Years of experience and testing are involved in each compound recipe. Lastly note the example of tractors used for roadside mowing or snow removal. In this case the most important factors to consider are the lug design with sharp edges and steel belt construction. Unfortunately, as crops grow taller, stronger, and produce more yield, stubble damage will become a greater concern for the farmer. Today, there are many different methods for combating stubble. There are rollers, stubble stompers, homemade devices, burning, and more. While many of these will achieve the objective, the unfortunate side effect is that these solutions come at an additional cost and a little frustration. Furthermore, these methodologies can be time consuming and require periodic maintenance, and in the worst case, your tires may still see damage caused by stubble. It doesn’t have to be a cost of doing business, though. Many years ago, Michelin R&D teams invested a significant amount of time and resources designing tires for superior stubble resistance. The result is Michelin Stubble Shield rubber technology. Stubble Shield is a specialized rubber compound and anti-stubble reinforcement in the tread area of the Michelin Yieldbib radial tire, complete with a two-year free replacement Stubble Damage Warranty and VF high carrying capacity. Due to Michelin standard rubber compounding and stubble deflecting sweeping 45 degree R-1W design, even our standard tires without Stubble Shield offer excellent stubble resistance compared to others. In summary, the first and lowest cost approach to reduce stubble is to purchase the right tire, with the right rubber compound and right sweeping 45 degree lug design. As a backup plan, if your stubble damage is persistent, a mechanical device may be a sound investment. Farming efficiently and profitably should be top of mind. Your tires shouldn’t need to be. As a farmer myself, I see crop stubble becoming more and more of an issue for tires. In the past, it was common to get complaints from growers about driving over corn or cotton stalks resulting in tire punctures. As crop genetics improve and growers focus on agronomics, additional crops like soybeans and cereal grains are now leading to tire damage. Growing up, Grandpa and Dad would drill soybeans at a population rate of 200k to 220k, and the stalks would have a maximum stalk diameter of 3/16”. Today, agronomists are suggesting rolling back those seeding rates to allow the soybeans to bush out. When I measured the stalk diameter of a soybean field planted at 140K population rate, the diameter ranged from ¼” to ½”. 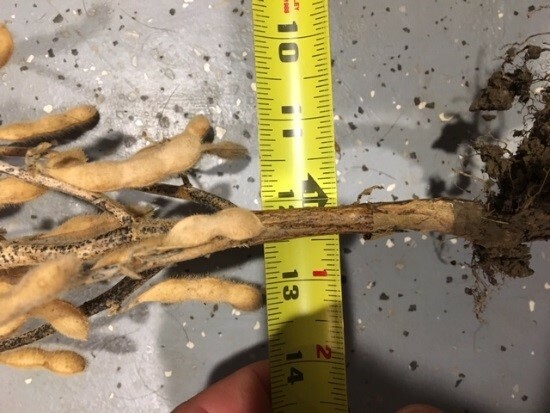 (See picture 1, which shows the stalk diameter of 7/16” from a 2018 soybean plant. The larger diameter stalk means a better stand at harvest, but it also causes more damage to tires. When customers have stubble issues, the common assumption is that the tire’s tread rubber is softer or under-cured. 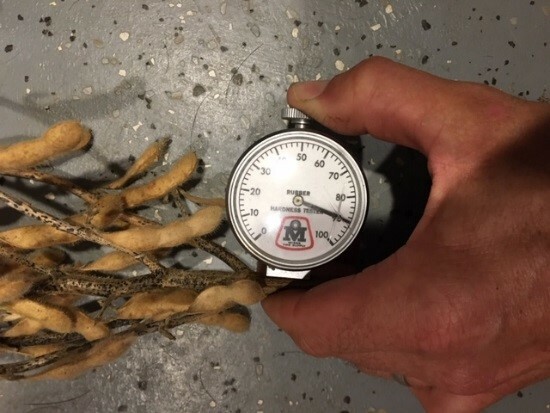 To get into the science of tires, tire manufacturers measure tread rubber hardness with a tool called a durometer (See picture 2). The typical agricultural tire rubber hardness ranges from 66 to 74 units. This level of hardness is required to allow the rubber to flex over different terrains and with different inflation pressures. Firestone has measured crop stubble in the field and it can range between 80 to 110 units. The hardness of the soybean plant we measured, which had a stalk diameter of 7/16”was 90 units. When a softer material makes contact with a harder material, the softer material is damaged. Tire manufacturers are working on a solution, but at this point in time there is no solution. Yes, a harder tread compound could be used to help reduce stubble damage, but the harder tread rubber could cause decreased tire performance because the harder rubber would have less flex. It is a balancing act for tire engineers, and until a solution is identified, tire companies encourage customers to find mechanical ways in their operations to manage the stubble. Stubble can be managed in a variety of ways, from something as simple as not driving directly over the stubble, to installing a stubble-deflecting device. I encourage customers with stubble problems to install stubble prevention equipment on the corn head or platform to push the stubble down while harvesting. If the customer cannot install stubble deflectors on the heads, there are nice stubble deflection devices that attach to the front of a tractor. Customers do not have to spend a lot of money on stubble deflection devices, the device can be custom made. 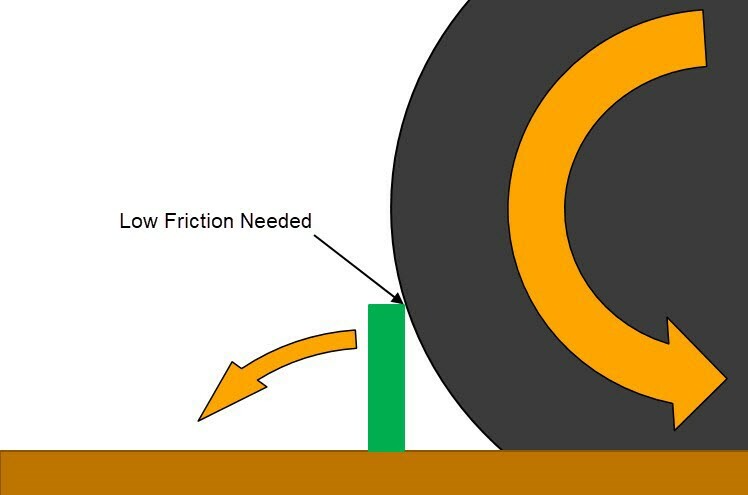 Firestone Ag does not recommend one system over another; the main point is to consider a deflector because it pushes the stalk over, helping to keep the stubble from coming into direct contact with the tire. If you are interested in looking at stubble protection solutions, we recommend talking to your local tire dealer or implement dealership. If your tires do have stubble damage, they likely can remain in service unless the tire’s body ply or tread ply cords are exposed. The tires in pictures 3 and 4 have stubble damage, but it is just cosmetic. The interior construction is undamaged and the tire can remain in service. If a customer is in the market for new tires and has concerns about stubble damage, they should ask the tire dealer about the tire’s stubble protection policy. Stubble damage is typically not considered a warrantable condition by most tire companies. However, Firestone Ag, along with other tire companies do have a stubble damage policy. This policy is different from the tire manufacturing warranty and the coverage is not as long. Your tire dealership should be able to explain different coverage options. I also encourage customers to avoid running brand new tires in heavy stubble conditions. If your operation is planning to install new tires on equipment, I suggest installing them after the planting or harvesting season. Giving the tires extra time to sit before use allows the processing waxes to migrate to the exterior of the tire. As these waxes move, a tire will slightly harden by 1 or 2 points. Again, there is no perfect solution for preventing stubble damage on tires. Ag tires are going to operate in conditions that will expose them to the potential of stubble damage. Taking the correct measures in your operations to minimize the exposure to damage by using stubble deflection devices or not running directly on stubble will help your operation minimize stubble damage. *Additional Thanks to Kelsey Jo Oechsle at Lankota for providing the stubble deflecting device picture. Why not just fit a baffle or shoe or surface bogeyed slide to bend stubble before it contacts the tire as upright? All tire manufacturers agree, the specific type of stubble device chosen is not overly important. As long as the stubble is bent as you say, “before it contacts the tire as upright,” tire wear, damage, and likelihood of puncture is dramatically reduced. The last important point is that we always recommend you consult with your equipment dealer to make sure stubble device you are considering will work well on the specific equipment you own.